With the new Assassin's Creed due out in just over a month, I've been anxious to see what the team at Ubisoft have in store. That's why I jumped at the chance to visit the studio's San Francisco offices last week to play through a recent build of the game. I am, admittedly, an easy sell for Assassin's Creed. I've been a big fan of the franchise ever since the sequel removed the missteps and polished the rough edges off the original. After experiencing the new location, new toys, and new gameplay elements I'm even more excited to get my hands on the full version of the game next month. I picked up with Ezio fairly early in Revelations, as he sails into the great city of Constantinople. After a brief but informative chat with his fellow passengers, Ezio steps off the ship onto the docks and into the large sprawling city. He's immediately met by Yusuf, his contact within the Assassin's Guild, who walks with him through the streets of the old city, outlining the various tensions between the Ottomans, the Templars, and the Assassins. It's a nice bit of exposition that gives players a chance to learn something about the political problems in the city, discover a bit about who Yusuf is, and see some of the sights. Before the pair can even reach the headquarters of the Assassin's Guild, Yusuf and Ezio are ambushed by Templars. You have to respect their devotion to their job, but these Templars obviously haven't seen what Ezio has done to their buddies in previous games. Within a matter of seconds, Ezio and Yusuf take down all their attackers, leaving them in a pile on the street for the Constantinople Department of Corpse Removal. After that light workout, it's just a short walk to the Guild headquarters so Ezio can allow his brothers to fawn over him. 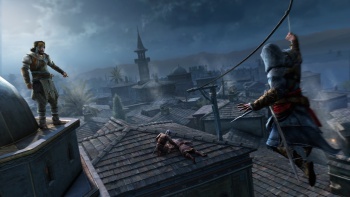 At this point, Yusuf lets Ezio loose on the streets of Constantinople. Ezio needs to upgrade his equipment and for that, he'll either need to perform odd jobs for the citizens or else seek out the chests hidden on the high rooftops and balconies of the city. Some jobs offer the usual sort of mundane business found in these games; in one particularly memorable case, he had to pick up five boxes and move them literally across the street. It's not quite as intense as stabbing a Templar to death, but I guess he's got make a living somehow. To better help navigate the ins and outs of the city, Yusuf equips Ezio with a new hook blade. This unique tool, which extends from the forearm, essentially allows Ezio to increase the distance from which he can grab ledges. The inevitably misjudged rooftop leaps or the windowsills just out of reach aren't as much of a problem this time around. As an added bonus, the hook blade can be used to swing from lanterns for an extended jump or to use the cables around the city to zipline from rooftop to rooftop. Better still, Ezio has a new takedown he can use while ziplining, which makes taking out the guards especially satisfying. The combat options don't end there, thanks to several new attacks, and a new hook-and-run move you can use to push enemies out of your way and vault beyond them. While these are fun tricks, using the hook blade isn't automatic, so it does require the player to be a bit more attentive and active. After a few minutes of practice and a handful of fatal falls, I got the hang of it and was climbing towers and doing aerial takedowns with the best of them. Also on the combat side, Ezio can craft a variety of bombs now. Components for these bombs - things like sulfur, gunpowder, caltrops, etc. - will be scattered throughout the city of Constantinople, and it's up to Ezio to gather them up and combine them to create unique explosives. If Ezio can get enough sulfur together, for instance, he can make cherry bombs that distract guards. If he gets enough coal dust, he can create thunder bombs to momentarily incapacitate guards. The bomb mechanic also benefits from the addition of a second attack button, which allows Ezio to shift back and forth among a wider variety of attacks this time around. While Ezio's combat options are definitely more strategic than they've been in past outings, they're made even more useful through the improvements to Eagle Vision. Now instead of simply highlighting the location of enemy guards and captains, Eagle Vision also lets Ezio see faint footprints for your enemies, which helps alert him not only to the possible location of enemies, but also their unique patrol routes. When he's trying to gain control of a district by taking out the Templar captains, this new vision mode is invaluable. I played around with all these new options for a good while before Yusuf asked Ezio to help defend an Assassin's headquarters against a Templar attack. Here, I was able to check out the strategic game. Ezio basically parks himself on a rooftop overlooking the headquarters. Templar enemies come from either end of the street and Ezio's job is to place crossbowmen and riflemen on the rooftops and barricades down in the streets to keep the enemies from reaching the door of the headquarters. The trick is that Ezio has a limited amount of morale with which to buy these assets and can only earn more morale by defeating enemies. It's essentially a fancy version of tower defense, but it works so well with the context of the game, that I found myself wanting to play it again and again. The gameplay shifts yet again when Ezio has to infiltrate a banquet while dressed as a minstrel. I won't spoil the story details here, because the conspiracy and connections start to get pretty thick, but Ezio and his buddies are essentially there to stop an assassination. Ezio essentially has to scour each group of partygoers, find the ones who are up to no good, and then use his lute-playing skills to distract the other guests long enough for his friends to step in and take out the killers. It might seem a bit of a departure for the death-dealing Ezio to sit around singing songs, but it works nicely in the context of the story and is a welcome change of pace for the series. From there, the story goes into even more intriguing directions, involving a return to Altair's story, uncovering a Janissary conspiracy, and loads of platforming in deep, dark places. Suffice it say that if you liked the previous two games, Revelations offers exactly what you're looking for with a few extra tricks thrown in for good measure. Assassin's Creed Revelations will be out for PC, 360 and PS3 on November 15.